Added match. The last time Bragg was seen, he was attacking Joe Lider, so of course they didn't get along here. Bonus match two. Faby earned a title shot at Taya at some undefined time. Drago got the win over Scoria. Suicide attacked people on both teams (his partner Begnala last), apparently snapping and turning rudo. Mami & Goya replaced Pimpi & Mamba. Pimpi and Mamba were added to the match. Mamba may be a OGT member; it was unclear. Pirata Morgan, who also may be an OGT member, distracted the tecnicos. The Psycho Circus were reunited for one night, with Murder fouling Psycho but Wagner fouling Murder for the win. Mocho Cota attacked the non-Poder del Norte people with a chair after the match. 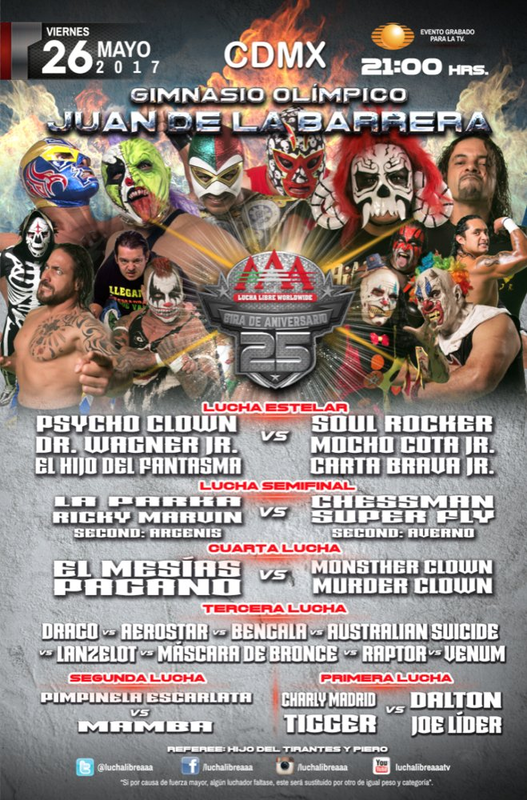 Aerostar & Drago were announced as being added to the Verano de Escandalo tag title match (but that might have changed again by the end of the night.) Suicide apparently didn't turn rudo, but freaked out again and cost his partner the match. New stip, where the elimination order determines which of the four mystery contracts they received. Venum was out first, and won a mixed tag title shot (as long as he can find a partner.) Lanzelot was out second, and will participate on Triplemania (in what sounded like a battle royal).) The debuting Raptor was out third, and will get a trios title shot with two partners of his choice. Mascara de Bronce was the winner, and will get a shot at Johnny Mundo. No date was announced for any of the matches. ordered as a title match by Vampiro. Cuervo & Scoria fall on defense two. Pagano & Mesias are the 19th champs. Pimpinela & Mamba were the seconds. Dinastia loses his title on his 8th defense (four years) when Mini Psycho uses the ropes to pin him. Mini Psycho is the 6th champ. Prior to the 3v2 match, OGT told Parka & Argenis claimed they had scared off their partner (not mentioning Ricky Marvin by name.) 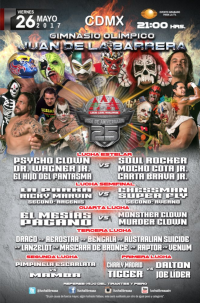 The tecnicos still won when Pirata Morgan came to ringside, teased as though he was going to do something with Parka, and then tripped up Chessman to setup an Argenis roll up. Psycho beat Texano when neither team could get along. Poder del Norte ran in to attack Wagner & Psycho. OGT ran into attack Poder del Norte, demanding a trios title match at Verano de Escandalo in addition to their mask match. Wagner also unmasked Psycho Clown.